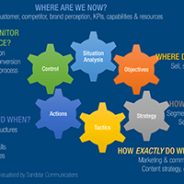 I attended a digital marketing seminar recently where the presenters used the SOSTAC® marketing model to help the audience structure an integrated marketing plan. I hadn’t heard the SOSTAC acronym in a long time and it prompted me to think about how we, as an agency, approach client marketing campaigns. For most campaigns, we follow the model instinctively, but I can see the benefit to explaining the model in certain situations with clients. Many people use the SOSTAC acronym as a generic term, however it derives from the SOSTAC® Planning System created by writer and speaker PR Smith in the 1990s, and is a protected registered trademark. The SOSTAC® model and associated methodology are now used around the world by large and small organisations. In some ways SOSTAC® has been a victim of its own success: rather like hoover means vacuum and xerox means photocopy. This is the price of inventing a good concept and name to go with it, but the trademark is still active. 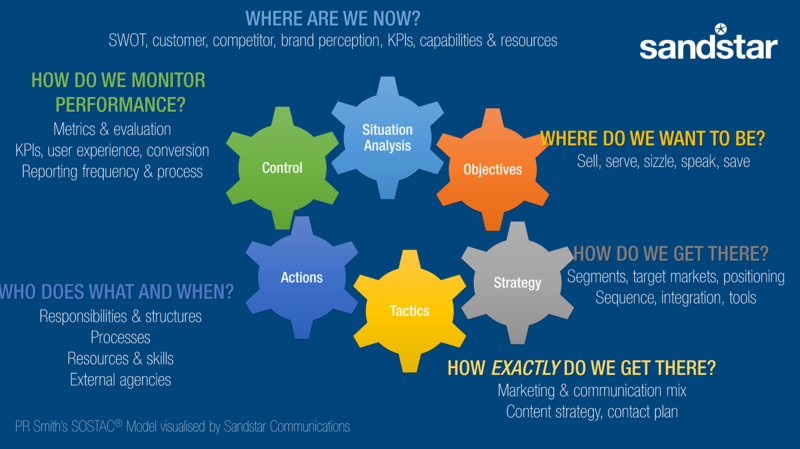 Since a picture is worth a thousand words, here’s a guide to the SOSTAC model visualised as a set of smoothly working gears in a perfectly oiled marketing machine. There’s obviously a lot more to be said about each of the stages in the model and there are extensions to the model that some argue make it more specific to digital marketing (Dave Chaffey’s RACE model comes to mind). But, whether you’re a small business looking for some marketing guidance or a large multinational that could benefit from a refresher in marketing basics, PR Smith’s SOSTAC model is an excellent starting point. If you’d like to talk about your marketing needs and how a structured planning approach could benefit your business, get in touch.